As promised, here’s the vCNS Edge upgrade step by step procedure. 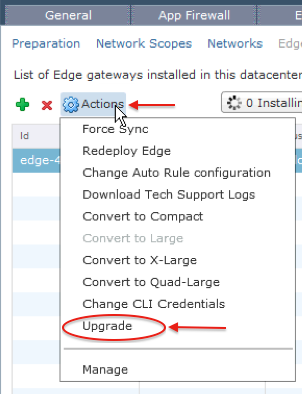 Before upgrade vCNS Edge you must upgrade vCNS Manager, if you haven’t done it yet, check the vCNS Manager Upgrade step by step post. That’s required because vCNS Manager holds the binaries to upgrade the others components, as vCNS Edge. - Click Yes to proceed with the upgrade. During the upgrade, there will be a brief network disruption to virtual machines that are using the Edge as their default gateways. The effect is isolated to traffic routed through the Edge Gateway, local traffic between virtual machines in the same subnet will remain unaffected. Also VPN connections will be lost and they will need to be reestablished. My advice is to perform this action only during periods of low utilization. Analyze the situation with caution before proceed. You can also check for more details at vCloud Network and Security Installation and Upgrade Guide or the KB article about the best practices for upgrading vCloud Network and Security.